How long have you been looking for the answer to a question "Can I share my computer with other users and how?" Or, maybe you have heard about software that makes it possible to multiply PC server for twin users and now are interested in taking advantage of it? IBIK company is here to offer you high-end innovative sharing a computer software ASTER that turns one computer into several fully independent workstations. ASTER is sharing a computer software that does not use thin clients and terminal stations. 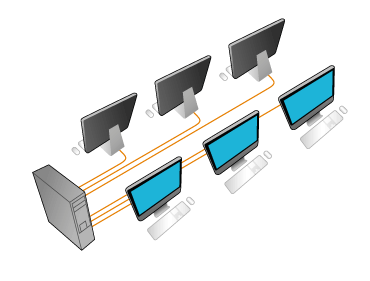 Allowing you to multiply PC functionality for twin users and even more, our sharing a computer software may be used in schools, universities, libraries, computer laboratories, accounting departments, offices, Internet cafes and other networked environments. Whether you’re still thinking if it can be used to share your computer at home, IBIK guarantees that our twin user PC application is equally efficient for home usage as well. In order to multiply PC server for twin users or more you will need another monitor, keyboard and mouse for each seat. After the installation and start-up process, sharing a computer software ASTER will provide each monitor with an individual virtual desktop and users will be able to work with the computer as independently as if each of them had their own PC. Be sure, with our twin user program you can multiply PC without slowing down your system! While you multiply PC server for twin users or more with sharing a computer software ASTER, you can simultaneously enjoy numerous benefits, such as low noise level, reducing your electrical bills up to 50%, cost of operating system, total cost of computer hardware and software purchase, etc! I.e. ASTER is analog of such popular programs, as MS MultiPoint, SoftXpand, Betwin.